The Canopy Collective is a group of local artists in various disciplines, from photography to poetry to sculpting to embroidery, who maintain a gallery and performance space at 3910 Lorain Avenue. 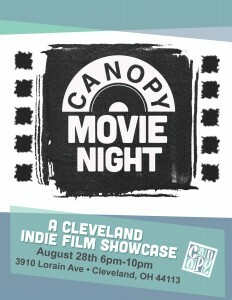 On August 28 the site will host the first-ever Canopy Movie Night, in which a collection of locally wrought shorts, music-videos and clips from features-in-progress will be screened. Among those taking part are Turnstyle Films, a production company best known for DRAW HARD, a portrait of maverick Cleveland cartoonist and comic-strip supporter John G. Sickening Pictures is Zach Shildwatchter’s outfit specializing in grindhouse-horror style shorts riffing on serial killers and other unspeakable topics. University of Akron graduate (oh, is the University of Akron still in business? We thought it had sold on Craigslist) Mike Wendt, when not working as a location manager on visiting film shoots, has embarked on projects of his own, such as the documentary short feature about Cleveland rock radio THE END OF THE WORLD AS WE KNOW IT. Expect a few local premieres, refreshments, raffle prizes and Q&A sessions. Admission is $5, and the show lasts from 6 p.m. to 10 p.m. For more information, go online to www.canopy-collective.com.